Sketch Class Results March 2011 – Let's Paint Nature! 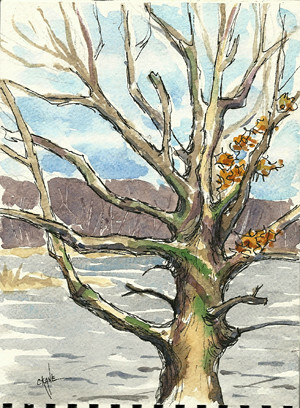 We take a short hike on the White Oak Trail before we paint, even though it is terribly cold with a persistent wind, we desperately want to connect with nature. In search for Spring Beauty wildflowers we come up short, instead we find a partially frozen stream with razor-sharp shards of ice and geometric frozen patterns. It is officially spring, but where is spring? That’s okay, we are nature diehards. 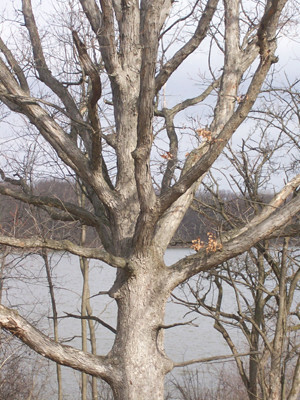 This day we decided to concentrate on a particular oak tree along Long John Slough. Transfixed with the beauty of just the trunk, we celebrated it by making a quick watercolor sketch. Briefly when the sun peaked out, we quickly noted bright green moss color on the trunk and casting shadows as well. We decided to keep warm and sketch from inside the educational center after our hike. 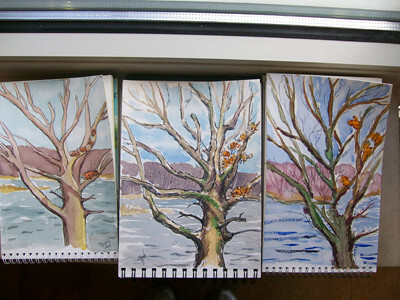 Here is a collection of our beautiful oak tree watercolor sketches. Quick and loose was our goal, I think it only took us about 45 minutes. We will not be detoured by cold temps even though our high is supposed to be 50°F. But hey, with Chicago weather, we can always expect some snow in April…right?!? Bite my tongue! Great work! As one who lives in Indiana I am right there with you – wind chilled, snow flurried and occasionally sitting in the sun. The work done by your group is wonderful and I see why the massive tree inspired you. Keep up the good work and thank you for sharing your lovely words. Spring is such a grab bag of weather. I love that you forged ahead and still recorded the beauties of a 25 degree spring day. Lovely works. Hi Chris: Love the trees. We skethed an old fruit tree with a few Cherry Blossoms in our art classes on Saturday. We did them in Water colors, I’ll scan it soon, however, I hung it up with a title from the computer. In 1913 the Japanese donated 3,000 Cherry trees to the US. They are planted around the White House, Potomac River trails. The students enjoyed painting the cherry blossoms, we too can’t wait for the rebirthing of life this year. It will come right around Easter, when the entire East Coat of US will spring into Spring and we will have flowers and buds. It was 12 degrees in Pittsburgh this morning and I know Chicago gets chilly around the lakes. Keep on sketching and Painting!!!!!!!!!!!!!!!!!! Of course yours is the best but I am impressed with what your students did. Good teacher!! We had some snow on Monday and an earthquake. Yesterday, it was warm again but today chilly and rainy. Linda: Thank you, yes, the group is terrific and they did a really, really great job…they are hard workers! Oh will spring get here soon??? We will love it even more when things thaw out!!! Hang in there! jwms1: Thanks! Yes, even a 25 degree day has some beauty! Pat: I would love to see your cherry blossom tree watercolor! That sounds lovely! Thank you for telling me about your class and what you guys worked on…I love to hear about what others are studying in nature and art from other parts of the world/country. Hang in there, 12 degrees is SUPER cold for morning…warmer weather is right around the corner!!!! Joan: Yes, I am very proud of the students! You can see how they have developed over the months. They are creating outstanding memories for their journals. WOW an earthquake! Once when I was small I experienced one in CA. It was scary…hope yours was not big and did no damage.